"We should not forget this people that suffers"
Yesterday marked the one year anniversary of the devastating earthquake in Haiti. Pope Benedict sent his prayers and spiritual closeness to the Haitian people on the anniversary, a message that was delivered by his envoy, Cardinal Robert Sarah. The president of the Pontifical Council Cor Unum traveled to the country on Sunday and among his activities, celebrated a commemorative Mass in Port-au-Prince. He also brought 1.2 million dollars to be used for the reconstruction of schools and churches. Before leaving for Haiti, the Cardinal told Vatican Radio that he wanted to show the people of Haiti that not only is the Pope close to the people of Haiti, but the whole Church is too. "We have done a lot," said the prelate, "but we should continue, because there is a lot to do: rebuild schools, hospitals, houses. Therefore, we should not forget this people that suffers and we should intensify the solidarity and support to help the people of Haiti to rebuild the country." The Catholic Register's Michael Swan traveled to Haiti recently and documented his experience, seen here. He also appeared on the Tuesday, January 11th edition of daily Perspectives with Jenna Murphy to discuss his trip. 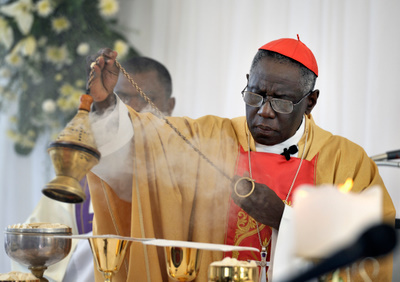 CNS photo/Paul Jeffrey: Cardinal Robert Sarah, swings a censer as he celebrates Mass in Port-au-Prince on January 12, 2011, marking the one-year anniversary of the Haiti earthquake. Held in the shadows of the ruins of the Cathedral of Our Lady of the Assumption, the gathering was one of many special observances held throughout the Caribbean nation.